The game consisted of a round of questions where three players compete for the right to spin on the big board and earn cash and prizes, then a round of playing the spins followed by one more round of questions and then a final round of spins on the big board. The winner at the end of the game was the player who collected the most money in cash and prizes. Part of the strategy for the big board was to spin a few times to collect enough cash and prizes then to pass on the remaining spins to another player who would have to play those spins in the hope that the passed spins would force that player to hit a Whammy to steal their cash and prizes. It was a fun and high energy show that got quite competitive and a player could hit three whammies and stay in the game. A fourth Whammy eliminated them from the game. 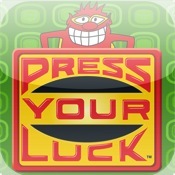 I got excited about an upcoming Apple iPhone and iPod Touch version of Press Your Luck coming out when Ludia, the company that developed the game indicated it was coming soon in their release of an application in the iTunes App Store for Family Feud. Ludia has done wonderful work recreating the sense and feel of both Family Feud and their first game show game, the Price is Right that I had no worries that Press Your Luck was going to be great when it finally got released. And sure enough the game is a lot of fun completely capturing the nostalgia of the game along with being a fun game to play. The sound effects from the original show are all there and it feels as close to the original show as you can have. Not bad seeing a 2010 release for a game show that only ran from 1983 to 1986. Click here to get it in the iTunes App Store.